New column over at Tor.com. I am a bit slow about doing stuff lately. But at least there are pictures. Books by Robert Jackson Bennett, Ann Leckie, and Sarah Rees Brennan. 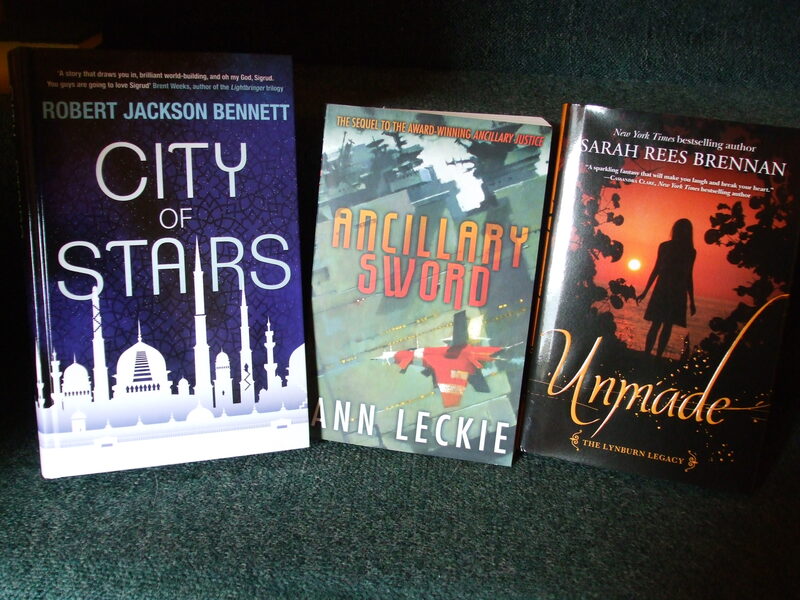 That’s Robert Jackson Bennett’s CITY OF STAIRS, Ann Leckie’s ANCILLARY SWORD (EEEEEEEEEEEEEEEEEEEEEEEEEEEEEEEEEEEEEEEEEEEEEEEEEEEEEEEEE) and Sarah Rees Brennan’s UNMADE. Aliette de Bodard’s short story at Subterranean Press, “The Days of War, as Red as Blood, as Dark as Bile,” is marvellously bitter and affecting. While at Clarkesworld, Seth Dickinson’s “Morrigan in the Sunglare” makes an interesting counterpoint. Both are stories about war and loss, but they approach their subjects from widely divergent angles. They’re both pretty good, by the way. Just in case you were wondering. Depression is hard to understand, because it is not a consistent state. Depression is rather like a virus, but like a virus, it has its manageable days and its acute, life-threatening flare-ups. You can be in a depression and still laugh at a friend’s joke or have a good night at dinner or manage low-level functioning. You grocery shop and stop to pet a puppy on the corner, talk to friends in a café, maybe write something you don’t hate. When this happens, you might examine your day for clues like reading tea leaves in a cup: Was it the egg for breakfast that made the difference? The three-mile run? You think, well, maybe this thing has moved on now. And you make no sudden moves for fear of attracting its abusive attention again. Other times, it’s as if a hole is opening inside you, wider and wider, pressing against your lungs, pushing your internal organs into unnatural places, and you cannot draw a true breath. You are breaking inside, slowly, and everything that keeps you tethered to your life, all of your normal responses, is being sucked through the hole like an airlock emptying into space. These are the times Holly Golightly called the Mean Reds. I call it White Knuckling it. When it’s White Knuckle Time, you will have to remind yourself to stand in the middle of the subway platform, well away from the edge. Yep. That’s a thing. That’s a thing that’s happened to me. Mary Beard talks about women’s voices. Sarah Rees Brennan writes trenchant critique of the ways women are judged for writing fanfiction. And here is a discussion on the popularity, or lack thereof, of lesbian romance.